Do you have items around your house that you just can’t seem to get rid of but that are no longer of use? I have so many old things in my house that I really need to turn into repurposing projects, including a few old rolling pins. I love the old tradition of giving a rolling pin to a bride to be for her wedding – you know, as a husband tamer. I also love finding old kitchen wares at thrift stores and finding new ways of using them, which is what has led me to these 16 fun and creative ways that you can repurpose old rolling pins. I stopped at Goodwill just a few weeks ago and they had so many old wooden rolling pins! I couldn’t stop myself from grabbing a few (they were, after all just a dollar each). Even if you don’t have a collection of rolling pins that you can use for a great repurposing project, you can always find them at thrift stores or yard sales and they’re going to be really cheap. Once you have a few to use, you can make so many wonderful things from a rustic apron rack to wall art. Repurposing old things is one of my favorite pastimes and if I can get some great rustic decor out of it, I consider it a double win. Just look at these 10 rustic pallet repurposing ideas for the kitchen. If you love repurposing projects and you love rustic décor, you are going to adore these 16 decorative repurposing ideas for those old rolling pins. From kitchen décor to wonderful gifts, there is something in here just waiting for you to create it. 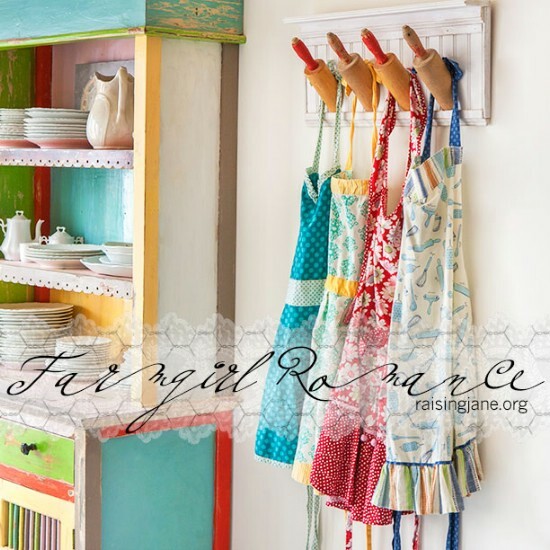 Any one of these projects would make a wonderful wedding gift and if you really love reusing those old kitchen items, be sure that you check out these 50 repurposing ideas for old kitchen items. You can turn your kitchen into a rustic dream come true! What can you do with a handful of wooden rolling pins and a great container? You can turn them into a beautifully rustic display for the kitchen. Even if you don’t plan to use those rolling pins, they can add farmhouse style to your décor. An old wooden crate and some stone wear canisters work beautifully for this display or you can add those rolling pins to anything – and decorate the container however you want. 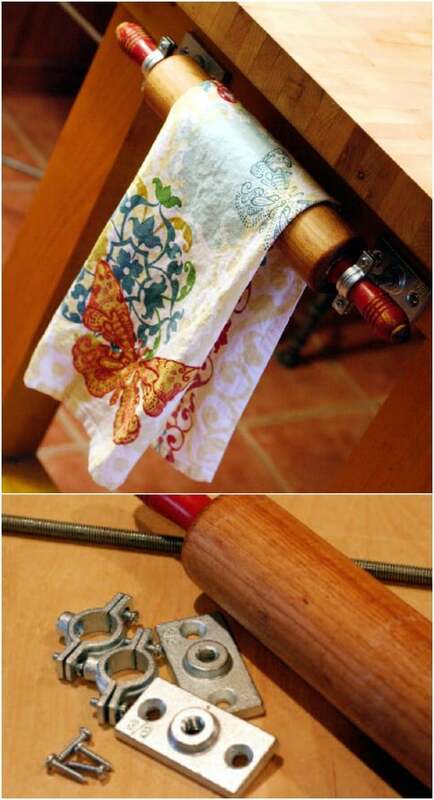 I love this idea of turning an old rolling pin into a farmhouse inspired dish cloth holder. You can hang this inside your cabinet door but why would you? Hang it on the outside under the sink cabinet to give your kitchen such a lovely rustic look. This one is super easy, too. You just have to have a rolling pin and the hardware to hang it up. Who wouldn’t absolutely love this apron holder in their kitchen? You make this one with two old rolling pins – or more if you need them – that are cut in half. The entire look of this is so rustic that I love it and it is the perfect way to hang and display all of your favorite aprons. This would look especially rustic with a homemade repurposed blue jean apron. 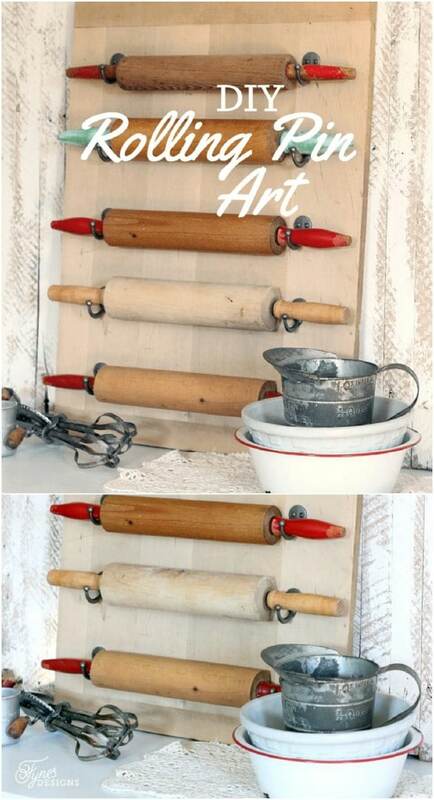 If you just can’t find anything else to do with those old rolling pins, you can turn them into the most amazing wall art. This is the perfect art to hang in your farmhouse inspired kitchen and it is super easy to make. You can hang however many rolling pins that you have on hand – one or five or more – and display this in the kitchen to show off your rustic style. 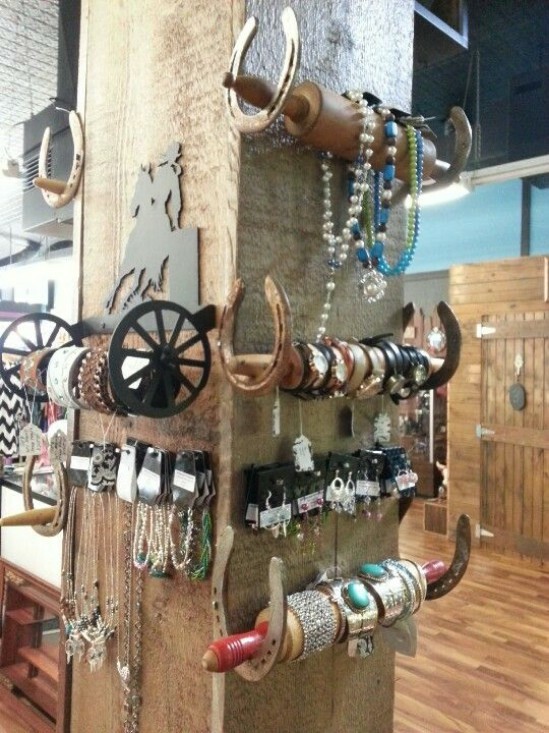 This beautiful jewelry holder is made from an old wooden rolling pin and a few old spoons and it is fabulous. You could hang this in the kitchen to hold aprons or towels or in the bedroom as a jewelry holder. It would also make a gorgeous cup holder for those decorative tea cups and mugs. I found this one on Etsy for less than $20 but you could easily recreate the look if you have the supplies on hand. 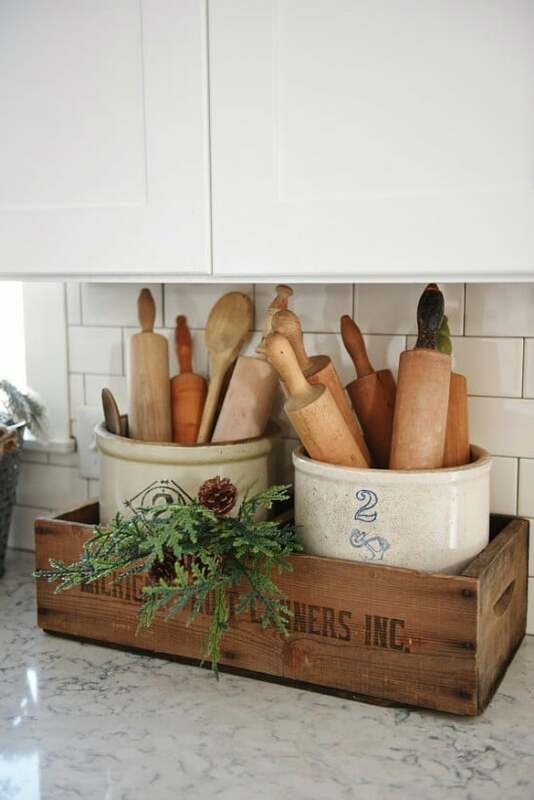 An old metal basket makes the perfect centerpiece to hold those old wooden rolling pins and give your kitchen or dining room a great rustic look. This project is so simple. 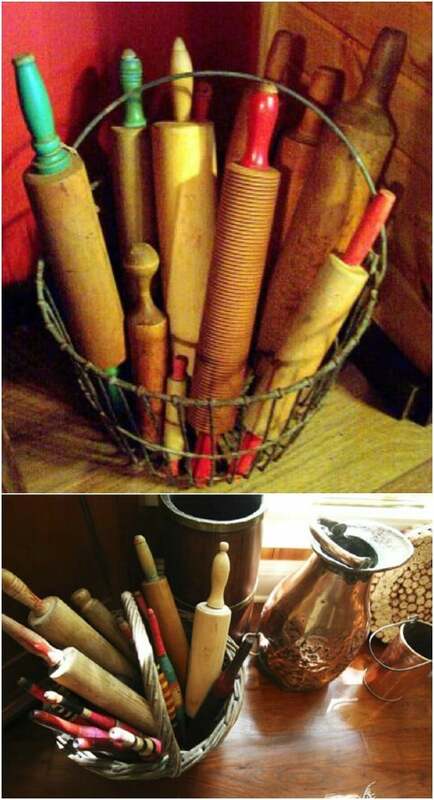 You just find an old basket and stand your rolling pins up inside it. So easy and yet it makes such a profound decorating statement. Check your local thrift stores and flea markets for old metal baskets to use…as well as wooden rolling pins in all shapes and designs. Take that old wooden rolling pin out to the front porch and turn it into a rustic flower hanger. These are really easy to make and are perfect for adding that little bit of farmhouse décor to your outdoor living spaces. 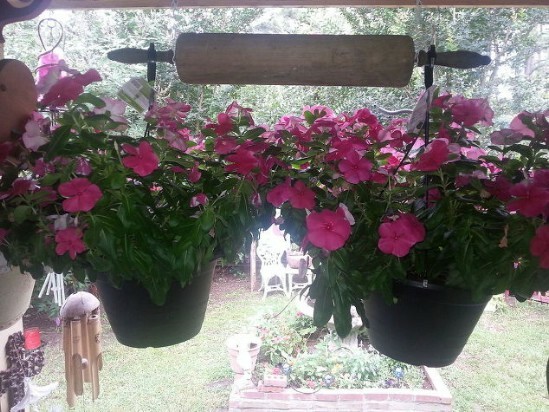 Once you get the rolling pin hung up, the flower baskets slip perfectly onto the handles, giving you a beautiful display for the front porch or garden. 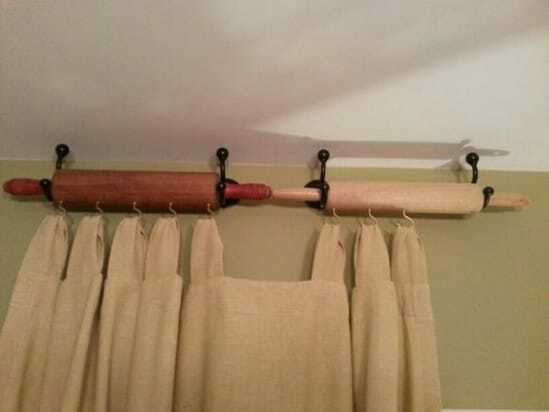 How about turning that old rolling pin into a gorgeous new curtain rod? I love this idea, especially for the kitchen or bathroom. You can easily do this with a coupe of wooden rolling pins and some curtain hooks. You will need hooks to hang your rolling pins from the ceiling and then smaller hooks that you will insert into the rolling pins to hang your curtains. 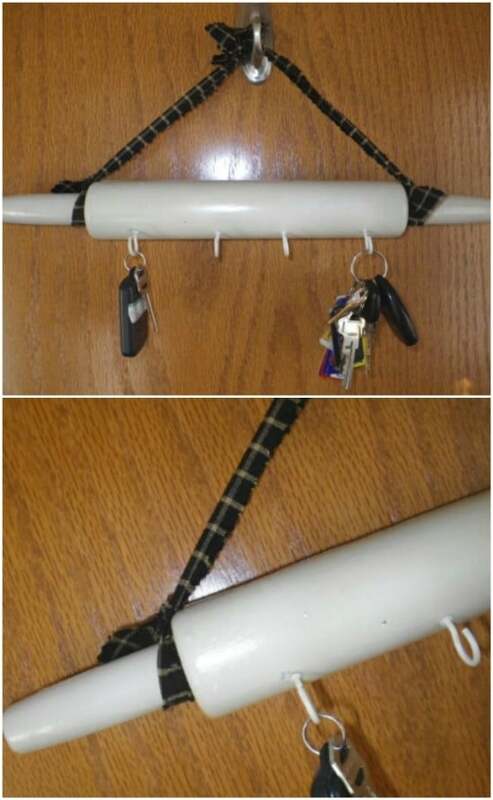 I love unique DIY curtain rods! How adorable are these DIY bookends that you make from old rolling pins? 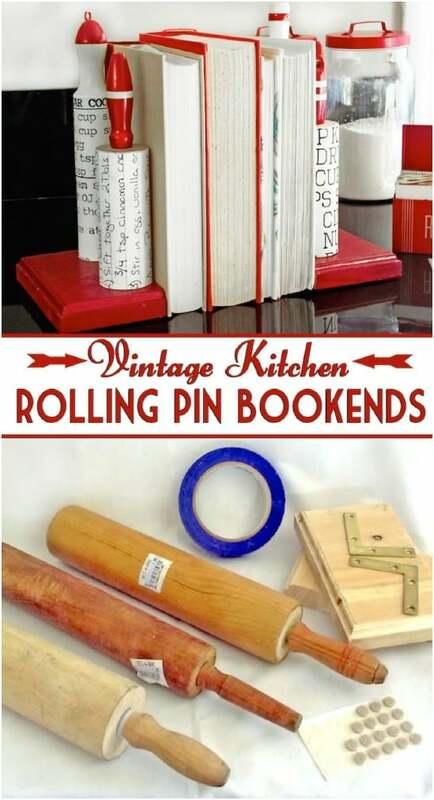 These are the perfect way to display your cookbooks in the kitchen and add a bit of vintage charm at the same time. They’re super easy to make and completely customizable. You can paint or design them in any color or theme that you need, or just use them plain if you want a more rustic farmhouse look. Display those old wooden rolling pins on the wall, where you can easily grab them when you need to use them. I love this display. It is super easy to make and it adds such a gorgeous rustic look to the kitchen. Hang this wherever you want to keep your rolling pins on hand. You make it from rolling pins – however many you have on hand – wood and a few decorative hooks. This little recipe holder made from a repurposed rolling pin is so cute and it is really easy to make. I love how handy this one is. 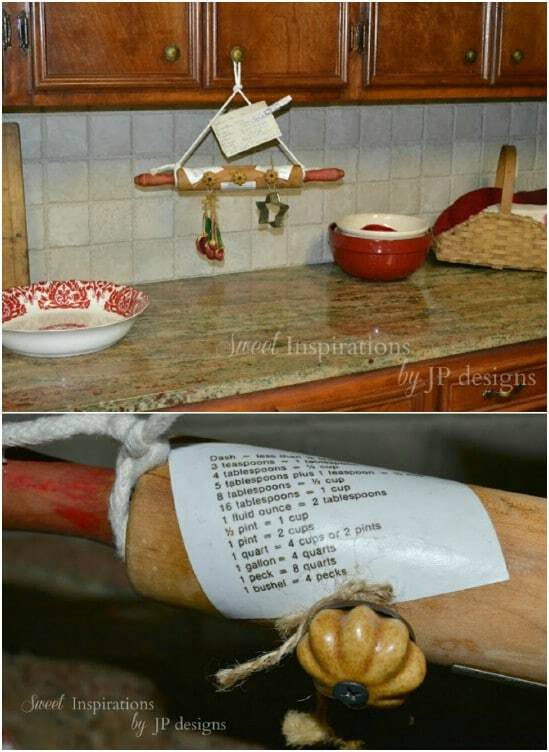 It will keep your recipe right there where you can see it by hanging it under your cabinets and you don’t need a lot of hardware or supplies to make this one. Use whatever size of rolling pin have on hand and decorate however you want. This would make a wonderful gift for anyone you know who loves to cook. 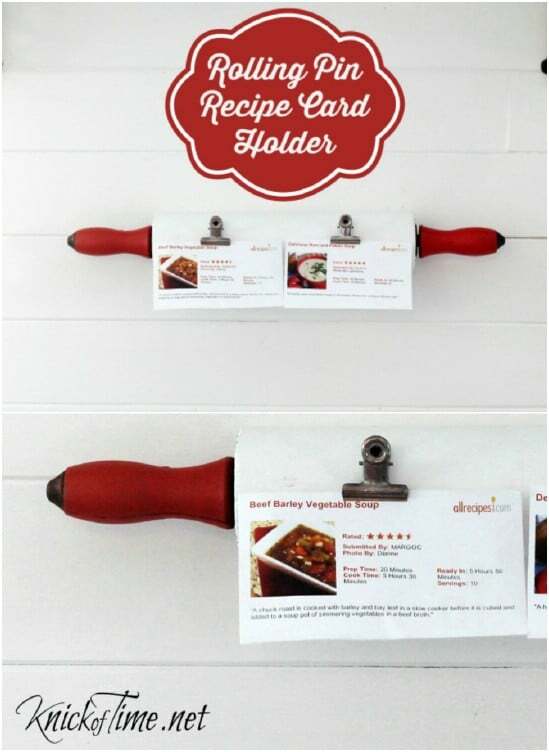 You can use your old rolling pin to make the perfect holder for any cards – recipe cards or even bills. This would be so cute in an office for holding business cards or upcoming bills or other important notes. You just glue hooks onto the rolling pin and then add the hardware that is needed to hang it up. Paint or decorate this one however you like to match your kitchen or office décor. I love this painted rolling pin for decorating the garden. It has such amazing coloring and the Live Simply message is so perfect. I found this one on Etsy for just $15 – although you could easily do this one yourself if you wanted. You can display this one in the garden, on the porch or even hang it in the kitchen. It adds rustic charm wherever you put it. I love this rustic kitchen island, complete with a rustic wooden rolling pin towel rack. This is one of the simplest projects for repurposing those rolling pins and you can add as many as you need. Have a towel rack on every side of your rustic kitchen island if you want – you just need one rolling pin for each towel rack along with the hardware for hanging them. Turn that old rolling pin into a beautiful tiered tray for displaying fruit or your favorite baked items. This tray also works really well for organizing jewelry or any number of other things like office supplies and such. It is really easy to make and has the most wonderful farmhouse quality, don’t you think? You make this from an old wooden rolling pin and a few old cake pans or platters. You can also turn your old rolling pins into adorable key holders with just a few basic supplies. I love this for hanging by the kitchen door or you could put it in the foyer or living room if you want to add some rustic charm to those rooms. I found this one on Etsy and it’s already finished for you, for less than $15. It has four hooks for holding your keys and hangs from a strip of rustic fabric that is adorable. Thanks for posting my rolling pin tiered tray blog! Loved all the other ideas also! Great job! 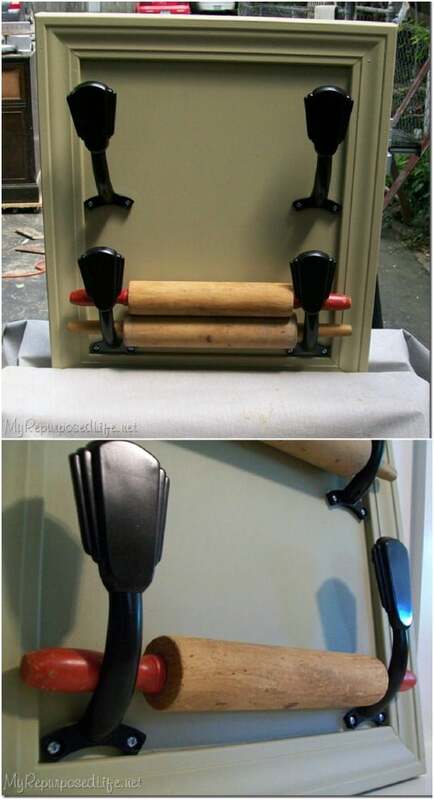 Thank you for the ideas on how to refurbished rolling pins especially the 3-tiered fruit or baked goods tray.